This chapter examines the major global remotely sensed mangrove databases that have become accessible since the year 2000. By doing so, we summarize the significant methodological differences between each product and provide a best estimate of post-2000 mangrove cover at the global level. We then review remotely sensed mangrove area findings in-depth for all nations in the Western Hemisphere and Oceania with mangrove holdings in the top 20 nations globally and then summarize the findings for all nations in the Western Hemisphere and Oceania with mangrove holding in the top fifty nations globally. In addition to reporting the mangrove area quantified by each national remotely sensed database, we assess the temporal domain, the spatial resolution, the instruments used, the techniques applied, the validation performed, and the error statistics reported for each national mangrove estimate. We then compare the national remotely sensed mangrove area estimates provided with each other and with the global estimates for each nation and then arrive at a post-2000 best estimate of mangrove cover for each country. Next, we review the common remote sensing techniques and instruments used to map and monitor mangrove forests throughout this chapter. 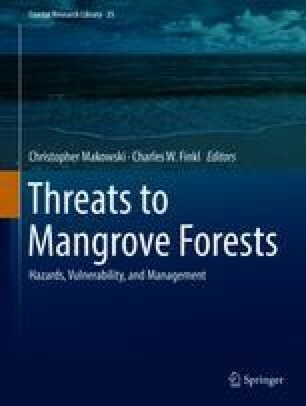 Finally, we assess the future requirements of the mangrove community considering what the remote sensing community can realistically deliver. We find that national remote sensing estimates of mangrove forest area align well with the global remotely sensed measures of mangrove forest area and can, in general, be used with confidence to manage and monitor mangrove forests.